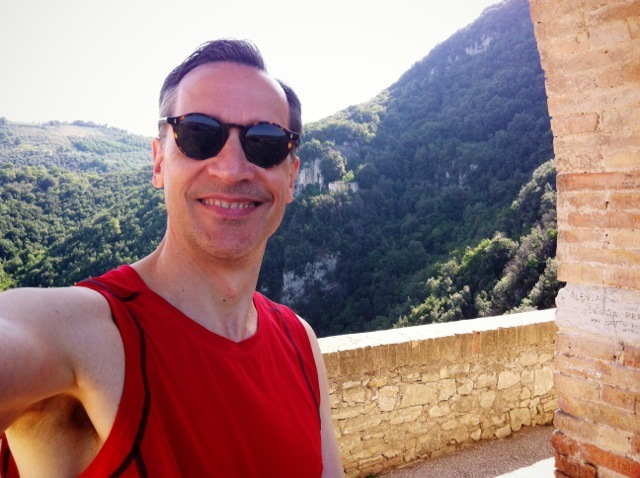 Well....I've been on vacation for the last couple of weeks, singing in Italy with Umbrian Serenades, a wonderful choral ensemble that was founded by Paulo Faustini ten years ago. That's where you see me in the photo, crossing Ponte delle Torri—Spoleto's aqueduct, which leads to Monteluco mountain, which takes about 45 minutes to climb via a pretty steep trail. I went up and down 6 times. In silence. That's not something I could have done after my tinnitus onset, which took place in the Spring of 2007. No sir. I couldn't be in a silence environment for more than a year. Which brings me to the point of this post. A gentlemen who read my original post on surviving tinnitus called me up yesterday, having just experienced his own sudden onset not more than 3 months prior. His questions were numerous and to the point. Would the loudness change? Would he be able to have a life again? Would he be able to continue to work? Yes, yes and yes came my reply. "Think of yourself as two people" I said. "The first is the person you were before tinnitus, and the second is the person who has survived tinnitus. You aren't going to be able to be that first person again, and not being that person means going through grief. That's the deal. Grief has five stages. Just know that you are going to go through them all, and you will probably bounce back and forth between them. This is normal. If you practice some simple steps, you will come out of it Ok, but it's going to take a while as well as involve having a "practice," which is not the same thing as taking a pill." What are the simple steps to surviving tinnitus? The biggie is learning to deal with your emotional and psychological response to the tinnitus signal. If your onset was a big deal, your response will need to be in equal proportion to it. If you heard bells and whistles and crashing and banging going off like I did, you are going to have to deal with your response in a systematic way with hammer and tongs. Why? This will be the only way to reduce your awareness of the tinnitus signal and get your life back. Five tools helped me deal with my emotional/psychological response, and thus change my brain's response (neuroplasticity) to the signal itself. 1) The first and perhaps most effective tool for me was the practice of Tonglen—which is a Buddhist meditative technique. How does it work? As you inhale consciously and slowly, you visualize whatever thought or feeling you are having as black smoke which enters your heart. When you exhale consciously and slowly, you beam rays of bright light out from your heart. Guess what takes over? The thought you are having, which could be "damn, I hate, hate, hate this, why me?" loosens up and becomes workable. With practice, this leads to a reduction in awareness of the tinnitus signal which is—measurable speaking, only 15 decibels—half of a whisper. Of course, the mind can ramp this signal up big time. The practice of Tonglen is—hands down—the best practice I can give to anyone who asks me about how to deal with their onset and reaction to it. The practice itself means literal warm-heartedness with a great sense of equanimity (space). Thoughts about the signal and the response to it became de-concretized and thus workable over time. As a result, awareness of the signal changes. 2) Listen to music. Don't be in a silent room. Play music so that it mixes, but does not cover the tinnitus signal. I did this for a couple years after my onset. This same principle is used in an App called "Tinnitus Pro" which I've known about for a while now, but haven't used much for the simple reason that I've habituated to my tinnitus signal. 3) A little cognitive behavior therapy goes a long way. In my case, I read about CBT and thought, "Gee, this sounds like Tonglen but with fancy words added." 4) Use a sound generator at night (mine was from Brookstone). Find a sound that mixes in with the signal but does not mask it completely (the sound of water usually works well). I did this for about 2 years, then forgot to turn it on one night, and realized that I didn't need it anymore. 5) Have fun! Sounds simple, but if you are in the wake of a big emotional response to your onset, this can be difficult if not impossible at first. I told my caller something that stuck with me, which was the realization of utter silence during the first time I made love after my onset. Why? My brain was one-pointed with pleasure—so much so that I didn't hear a thing, that thing being the tinnitus signal itself. When Robert Campbell told his students to "Follow Your Bliss" he wasn't kidding. This axiom has practical consequences. The truth of the matter is that you are going to have to deal with your self in a way that may seem foreign and uncomfortable, especially if you are the kind of person who breezes through life without much care or thought. That will have to change. You are going to have to become pro-active. My tinnitus signal is always loudest in the morning, especially if I have had a couple of glasses of champagne or proscecco the night before. Do I let this stop me? Are you kidding? I had a grand time in Italy, singing and having fabulous dinners where the wine flowed freely. And I climbed up Monteluco mountain to the sacred forest, relishing the silence along the way.